Community acquired pneumonia and hospital acquired pneumonia recommendations here. Kumar A et al. Duration of hypotension before initiation of effective antimicrobial therapy is the critical determinant of survival in human septic shock. Crit Care Med 2006 Jun; 34:1589-96. Early administration of effective agents saves lives. Data regarding the benefit of rapid time to first antibiotic dose in septic shock are limited and controversial. A common question is how the effect could be time-dependent when patients might have waited hours or days before presenting. In a retrospective study sponsored by a pharmaceutical company, researchers assessed the relation between time to first antibiotic dose and mortality in 2731 hypotensive septic shock patients at 14 intensive care units. Research assistants reviewed charts and recorded data on a uniform data extraction sheet. Enrollment criteria were presumed or identified infection and sustained initial hypotension or recurrent hypotension after a fluid bolus. Forty-four percent of patients were admitted directly from the emergency department. The overall mortality rate was 56%. Among 2154 patients who received effective antibiotic therapy, survival was 80% in those given antibiotics within the first hour of persistent or recurrent hypotension. However, for each hour of delay during the subsequent 6 hours, the chances of survival decreased by 7.6%. In multivariate analysis adjusted for illness severity, antibiotic effectiveness, single or multidrug coverage, early fluid resuscitation, number of failed organs, and time to vasopressor administration, the strongest predictor of outcome was time to effective antibiotic administration. Only half the patients received effective antibiotics within 6 hours of hypotension onset, and 30% had delays of more than 12 hours. Comment: This retrospective study raises two critical concepts: First, prompt antibiotic administration in hypotensive septic shock is crucial, particularly if prospective observational studies validate that survival decreases with each hour of delay. Second, antibiotic delays are substantial, even in the sickest patients. 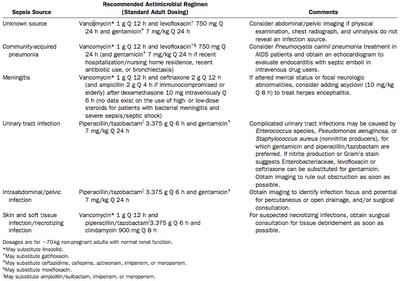 Emergency physicians should consider antibiotic administration as part of resuscitation rather than as postresuscitation care. If we are to improve antibiotic administration in septic shock, a systematic process design will likely be needed for each ED.